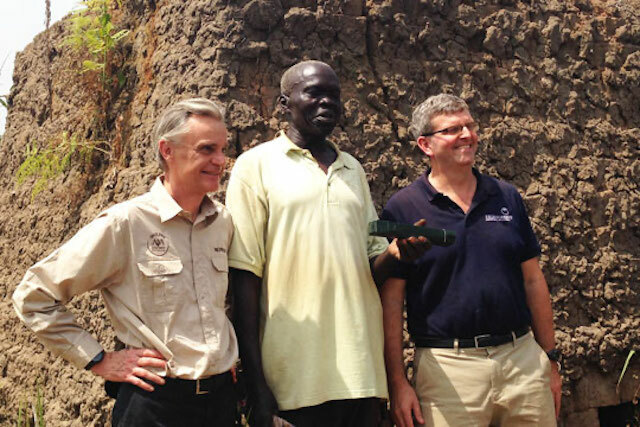 Will Warshauer and Jean-Marc Duvoisin with a coffee farmer in the AAA program in South Sudan. Coffee farmers around the world face increasing pressures from climate change, threatening their crops and their livelihoods. Since 2006, the international nonprofit TechnoServe and the premium coffee company Nespresso have partnered to develop sustainable coffee supply chains throughout the world, focusing on increasing farmer incomes, enhancing coffee quality, and improving climate change resilience. On Earth Day 2019, we asked the CEOs of TechnoServe and Nespresso to reflect on this sustainability partnership and the opportunities and challenges that lie ahead. 1) Why is it so important to work with coffee farmers to help them withstand changing weather and other climate-related farming problems? Jean-Marc Duvoisin: It is vital to preserve and protect coffee – for future generations of coffee-drinkers and for the farming communities who depend on it for their livelihood. Climate change poses a real and serious threat; from erratic temperature changes that can ruin entire harvests, to unpredictable rains that can wipe out whole landscapes. The regions where Nespresso sources its coffees are already experiencing the adverse effects of this change. Scientific reports forecast that by 2050, climate change could reduce the global area suitable for coffee production by up to 50 percent. I feel that as a premium coffee business, we have a unique opportunity. We can help to secure the long-term stable supply of high-quality coffee that our consumers love, while at the same time helping farmers to build their communities’ resilience to climate change. In 2003, we developed our own coffee sourcing programme, the Nespresso AAA Sustainable Quality™ Program. We partnered with the Rainforest Alliance and added one important element to their criteria: high quality. This approach guides our partnership with TechnoServe. Focusing on only high-quality coffee means better prices for farmers, so they increase their incomes too. It makes coffee farming sustainable from an environmental perspective, but also from a social and economic perspective. It helps Nespresso to address our business objectives; it means consumers continue to enjoy coffee; and it gives farmers an opportunity to build their own sustainable futures. Will Warshauer: I think that last point really illustrates how interconnected these challenges are – we all have a stake in the struggles of small farmers half a world away. And the struggles are becoming increasingly urgent. Imagine, if you can, the prospect of losing much of your annual income this year. How would you provide for your family? What cutbacks would you make? How could you choose between buying food or medicine? These are the kinds of choices that climate change is forcing upon millions of farmers in the developing world. More than 95 percent of the world’s coffee farmers are smallholders, who often depend on this crop for their livelihood. Unfortunately, these farmers are among the most vulnerable to climate change, lacking the resources to cope with the increasing onset of erratic weather, pests, and crop diseases. While clearly the world must do more to address the root causes of climate change, we can still do a lot to help farmers improve their resilience to climate threats right now. Learning “climate-smart” agronomic techniques and improving their knowledge, incomes, and access to markets make it easier for farmers to adapt, and even thrive, despite changing conditions. 2) How exactly do you help small farmers become more resilient to climate-related problems? Will Warshauer: You’d be surprised how some basic improvements can go a long way. Working with farmers to plant shade trees on their coffee farms, as we do with Nespresso’s AAA program, helps prevent erosion, improves soil nutrients, and increases carbon absorption from the atmosphere. Better mulching and pruning techniques – as well as integrated pest and disease management – can often mean the difference between a crop that survives erratic weather and a crop that does not. But building true resilience goes beyond that. We’re working with farmers to establish coffee cooperatives that help them share knowledge, improve access to finance, and increase the quality of their crops. We then help connect them to reliable buyers for high-quality coffee, like Nespresso – all of which improves their economic resilience and ability to withstand climate-related shocks. Jean-Marc Duvoisin: Climate, and in particular climate change, affects farmers in many ways. There is no one single solution – the answer must be adapted to the local context. One of the benefits of the Nespresso AAA program is that it can be tailored to different regions so that it tackles the specific challenges they face. We do this adaptation with TechnoServe, who has the expertise and experience to identify the solutions. The program is essentially about providing training to farmers, helping them improve their practices through expert advice, such as soil analysis, landscape management and book-keeping, and fostering a long-term relationship so that they have the confidence of having a stable buyer, year after year. One of the ways that we can support farmers to build resilience is through agroforestry, as Will mentioned – the planting of trees on farms. This helps to improve the quality of the coffee, because coffee requires shade. It also gives farmers an additional source of income because those trees can provide fruit. The trees help to restore the stability of the soil, making landscapes more resilient to heavy rains, effectively ‘reforesting’. And, of course. trees sequester carbon. We have planted more than 3.5 million trees since 2014, which equates to 130,000 tons CO2eq sequestered per year. 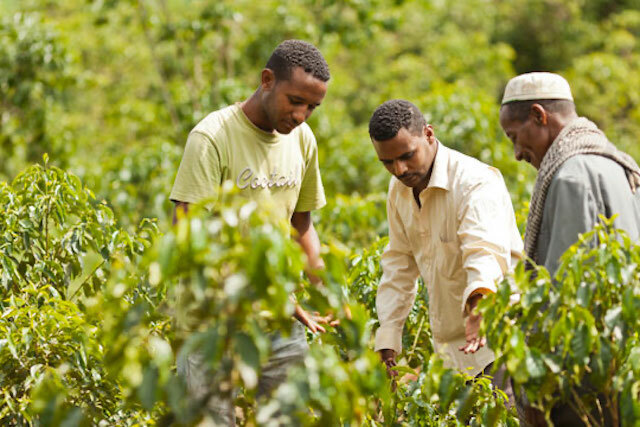 Coffee farmers in Ethiopia learn new agronomy techniques to improve the quality and resilience of their crop. 3) What do you see as the role of business in addressing climate resilience for small coffee farmers? Jean-Marc Duvoisin: For Nespresso, sustainability is part of our business strategy, and the Nespresso AAA Program is how we manage our value chain – it an essential part of our business model. That makes a real difference, because when sustainability is an optional add-on, companies can quickly drop their projects when budgets are tight. For us, ensuring that farms build resilience to climate change and are able to earn a good income from coffee are essential to sourcing a long-term supply of high-quality coffee for our consumers. Climate-smart farming is only one part of the equation; coffee must also be farmed in a way that respects and protects people too, so that it is appealing to future generations of farmers and ensures they will continue to grow the crop that we all love. Another interesting aspect is that as a large business, we have the ability to do things at scale and over a long-term basis. These are not ad-hoc small projects, but long-term commitments to more than 100,000 farmers around the world. It means we have the power to make a real difference, and partnering with other institutions allows us to scale our impact even further. We can only achieve this by working in partnership with organizations like TechnoServe. Will Warshauer: Agreed – this is a problem that affects all of us, and the solution must involve all of us: governments, research institutions, citizens’ groups, and everyone in between. But the reason that TechnoServe’s mission focuses on “business solutions to poverty” is because, as Jean Marc said, private-sector incentives can be a powerful force for sustainable impact when aligned the right way. Forward-thinking companies will incorporate sustainability into the very fabric of their operations – which includes a genuine commitment to the well-being of the farmers, suppliers, and small businesspeople that they work with. This reduces risk in businesses’ supply chains, it cuts costs in the long run, and it enhances their reputation in the eyes of consumers, who increasingly consider the ethics behind the brands they purchase. When major companies like Nespresso make a climate resilience program work successfully, it creates a positive domino effect in the business community – and even beyond. Anyone concerned about climate threats to smallholder farmers – which includes many coffee companies, but also governments, NGOs, and others – will sit up and take note. We’re now working to adapt successful models to other sectors and geographies, given the scale of the climate resilience problem for small farmers. 4) What are your future plans for working with small farmers on climate resilience? Will Warshauer: First, you have to be a little obsessive about finding what actually works. Most of our staff is local, and they work very closely with the farmers to track progress, determine what was the result of a TechnoServe intervention versus something else, etc. As a result, we have some proven methodologies that we’re scaling up around the world, while always adapting them to the local context and looking for ways to refine them even more. One example is the program we’re working on with Nespresso now in Puerto Rico. The coffee sector there was nearly wiped out after Hurricane Maria. So we’re applying the approaches that have helped other farmers recover from climate shocks around the world – teaching “climate-smart” agronomy, improving business skills, and making market connections that can survive a natural disaster. Technology will also play a huge role. In the past year, we tested how drones in East Africa could provide early warnings of crop diseases and pests, and how rapid soil-testing technologies can help small farmers determine the precise amounts of water, fertilizer, and other inputs needed to maximize yields. We’re also working on integrating blockchain into agricultural supply chains, a traceability technology that gives consumers a window like never before into how much their purchases are truly sustainable and climate-conscious. Jean-Marc Duvoisin: Building climate resilience is embedded across the Nespresso AAA Sustainable Quality™ Program, so it is a key component in all of the projects we do with farmers. Currently, we are focusing more and more on how to support farmers in fragile regions, where coffee farming has almost been lost or forgotten, or is not economically viable. For example, we are working with TechnoServe in Zimbabwe, where coffee production has plummeted to almost nothing. We are also working in Caquetá, Colombia, where decades of conflict meant that it was hard to make a living from coffee. Our consumers value the opportunity to taste these coffees, and it is very rewarding for them to see those communities learning how to grow a sustainable crop and earning a good income. We are also looking at how new technology can be used to better protect farmers from the impacts of climate change. We have worked with Blue Marble to develop an insurance product that, for the first time, means smallholder farmers can be insured against crop-devastating rainfall. The scheme uses a sophisticated model that combines satellite mapping and detailed climate data to assess when farmers have been impacted by heavy rains, and they automatically receive a pay-out. We are continuously working with our partners such as TechnoServe in the search for innovative solutions.